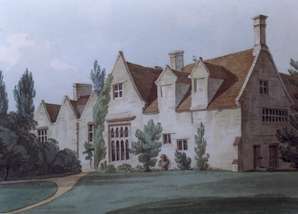 Turvey Abbey was the home of Charles Longuet Higgins. It is dated 1603 on the side facing the road and 1608 on the garden side. It underwent considerable additions in 1855 and 1860. The picture on the left show how it looked in the 1700’s. In the 1830's Charles Higgins compiled what he called 'The Turvey Abbey Scrapbook' - a large collections of his opinions, observations and illustrations. The rather clever poem on the right is his description of the contents! This remarkable collection can be seen in facsimile in the Bedford Record Office. Particularly of interest are the beautiful sketches that Charles did of his servants and villagers - plus detailed biographies or their lives and families. There are also maps, field rental information and all sorts of trivia on the village and its surrounds. I have included many quotes throughout these web pages. In the garden of the Abbey there is a very small, Gothick gazebo. It has the date 1829 inscribed above the door and it was built by the Longuet Higgens family. The Abbey became a Benedictine Abbey in 1980 when three monks and fourteen nuns came from Cockfosters (North London) and took up residence. The nuns call it a hermitage. Here you can find out more about the servants who worked for Charles Higgins, at the Abbey. 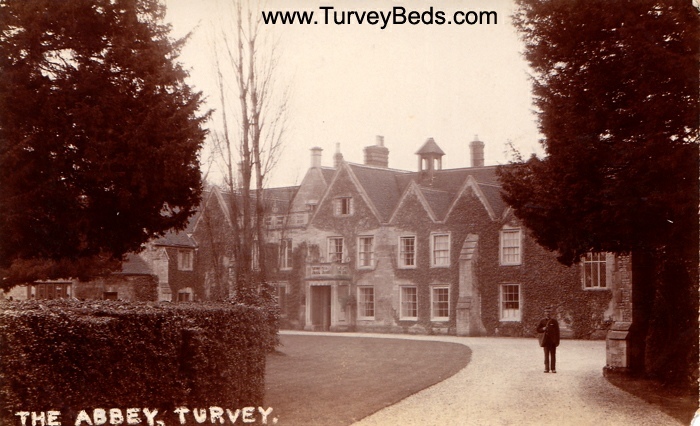 And here you can find more information on the current occupants of Turvey Abbey. This is the inscription that runs around the four beams inside Turvey Abbey. 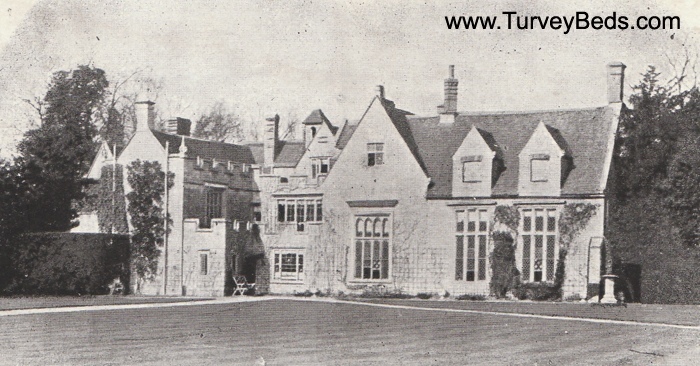 The Abbey was owned by Mr & Mrs Rupert Allen in the early 1950’s. Rupert Allen owned the Allen’s engineering factory in Bedford. 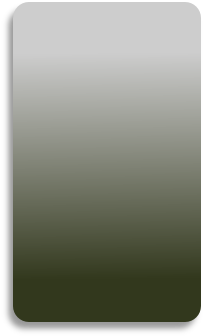 Click either to enlarge it. Ages could be rounded to the nearest 5 years for the 1841 census. Since 1964, Turvey Abbey’s dovecot has been a Grade II listed building in its own right. It dates from around the mid 1500s. It is square and made of coursed limestone rubble with an old clay tile roof. There are two upper windows with little shutters and a low doorway. There are gabled dormers with louvres. It no longer belongs to the abbey and is in Jack’s Lane.